Casa Nirvana is a traditional, stone built detached villa with balconies, terrace and garden. It has been lovingly restored and refurbished by the present owner and features cotto floors and an open fire, together with a pleasing blend of traditional and contemporary styling. Accommodation is provided on 3 levels: ground floor cooking and living, first floor bathroom, master bedroom and second bedroom and second floor mansarda (King sized room at the top). The landscaped garden boasts a spacious terrace for alfresco dining, sunbathing, or simply enjoying the magnificent scenery; and the enclosed lawn provides a safe play area for children. Car parking is both ample and convenient. Being just 1 hour from Pisa airport and within reach of excellent beaches and skiing, Casa Nirvana is centrally located in Lunigiana. It is a perfectly luxurious hillside retreat, for those not inclined to venture far; yet is ideally situated for the more adventurous to explore this beautiful part of Italy. We live on a smallholding in rural North Yorkshire and we share our UK home with Biba the Labrador, Delilah the Norfolk Terrier, Wilma Beagle, Mr Binx, Mrs Peacock, Isabella and Skye the cats, 3 horses, 2 highland cattle, a collection of geese and hens & a small flock of sheep! Life is not dull. It's not quite "The Good Life" because we don't live off the land, but we love the countryside and the idiosyncrasies of life in a country village. We have a long standing love of Italy. There is a passion about the way Italians do things; their food, their wine, their love of family, their style. The country is so historically and culturally rich. We originally set out to buy a holiday home but inevitably we have put down some Italian roots & Casa Nirvana is truly our second home. The food, wine, climate and culture were the reasons why we chose to buy another home in Tuscany, Italy. But there are so many beautiful areas in Tuscany that it took us a while to figure out precisely where we wanted to be. It had to be somewhere not too commercialised or touristy, somewhere that felt authentically Italian and somewhere easily accessible by road and air, because difficult travel arrangements would be a disincentive to popping over for short stays. We spent a long time looking at various properties, initially in the Garfagnana, but nothing seemed right. Then we found Lunigiana and instinctively knew this was the place. It has the coast, the mountains, a rich cultural heritage and such natural beauty. We felt at home. Having decided to focus our search on properties in Lunigiana, we set about drawing up a list of all the things that were important to us in our holiday home. Most of the houses and apartments just have terraces, but we definitely wanted a garden. Somewhere to put the sun lounger, the paddling pool and the football. Secondly, although we were not looking to have purely beach or skiing holidays, we wanted the option of spending a day at the coast or on the piste, without having to travel too far. We also wanted to be within an hour of an airport, central for sightseeing and handy for amenities. But we also yearned for somewhere peaceful and relaxing, where we could unwind and immerse ourselves in genuine Italian culture. Casa Nirvana ticked all the boxes on our very tall order! toilet, combination tub/shower, Full size, freestanding bath for indulgent relaxation! toilet, shower, Ground floor shower room with WC, washing machine & dryer. BATHROOM 1 Large family bathroom with the indulgent luxury of a full size, freestanding bath tub. Tiled throughout with shower attachment over the bath, period sink, WC and socket for shaver/electric toothbrush. Plush, quality towels, fine soaps and toiletries, ambient lighting, candles and bubbles! BATHROOM 2 Large ground floor shower room with shower cubicle, period sink, WC and socket for shaver/electric toothbrush. Quality towels, fine soaps and ambient lighting with plenty of space for robes and necessities. In keeping with the Italian habit of housing laundry equipment in the bathroom, the downstairs shower room is also home to a stacked washing machine and tumble dryer. WITH OUR COMPLIMENTS A range of Neal's Yard fine toiletries are provided in both bathrooms, along with candles and room fragrance. We also provide eco friendly laundry detergent and fabric softener. There is a wall mounted TV with terrestrial channels and guests have access to a Casa Nirvana Netflix account. A Bose Blue tooth speaker is provided. A selection of reading, cookery and tourist information books is provided, along with maps and other tourist leaflets. There is a good selection of board games and playing cards. There are garden toys for children and a garden play tent/sun shade, colouring books, jigsaws and other small toys. There is a good sized lawned area with sun loungers and drinks table and some planted ornamental beds for flowers and shrubs. A gardener keeps everything nice and neat. The "Royal Quarters" (master bedroom) has 2 balconies. One looking south east over the hills towards the bell tower in Villa, the other looking north west into the medieval Borgo. A large cotto terrace for sitting outdoors also houses a teak table & chairs for alfresco dining. 3 steps lead into the lawned and planted garden and there are stunning views from east to west. Ski resorts can be reached in about 50 minutes by car. Notes on accommodation: Casa Nirvana is a house of great antiquity and has been painstakingly and sympathetically restored and refurbished by the present owners. The interior features cotto floors, a solid chestnut staircase, exposed original stonework and an open fire. Decor and furnishings are a comfortable blend of old and new and modern conveniences sit happily with original rustic features. High ceilings and thick stone walls keep the house cool during the hot summers, so air conditioning is not necessary, but electric bedroom fans are provided for use in July and August, if required. In the cooler months the house benefits from gas central heating throughout, which is included in the weekly rental price and there is also a large open fire with a complimentary supply of logs. As a family home the house has been regularly and safely used by children of all ages. Outside: The house is on the edge of the village borgo and therefore has the dual benefit of charming and traditional medieval streets leading from the borgo to the back door, whilst remaining easily accessible at the front. French doors at the front open onto a large terrace, which leads down to an enclosed lawned and landscaped garden. There are stunning, panoramic views south and east, from the garden and terrace, across the olive groves and hills, to the Apennine mountains in the distance. At the back there is a ground floor entrance and an external stone staircase leading up to a second and private entrance to the master bedroom, which also has two balconies facing east and west. There is a freestanding charcoal BBQ, a large table for alfresco dining, and a selection of garden furniture for relaxing, lounging and soaking up the sun. The garden is enclosed and suitable for even very young children, but there are 3 steps from the terrace to the lawn so some supervision is required. All towels, bed linen and tea towels are included and changed weekly. A light clean of the house every 7 days is provided for guests staying longer than 1 week. Casa Nirvana was a haven to hang out in with beautiful views of the mountains and a peaceful feeling within the house and surrounding village. It being August and very busy in all the touristy places, we mostly preferred to hang out at the house as a family and enjoy the lovely space and view. Thank you for your review Rachel, I am so pleased you enjoyed your holiday and spending quality time at Casa Nirvana. I have always found the views quite special and the feeling of space and peace very relaxing. I have tried to make it as homely as possible because, although there is much to see and do in Tuscany, when I am in Italy I like to hang out at the house too and it's nice to be comfortable while doing that! Our stay at Casa Nirvana was absolutely fantastic. Set in the beautiful Tuscan hills, the location was just ideal for both a relaxing quiet break and for visiting the surrounding areas such as the amazing Cinque Terre along with Lucca, Las Spezia and the beautiful beaches at Marinella di Sarzana and Massa. The house itself was immaculate. 3 excellent double bedrooms, gorgeous bathroom with roll top bath and a kitchen that was just a joy to cook in. The views from the house are a joy to behold and as soon as we arrived, we relaxed immediately. Our son at the time of travel was just under 2 years old and had so much fun playing in the garden and exploring the beautiful village setting that Casa Nirvana is set in. I would highly recommend staying at Casa Nirvana and am already looking forward to our next stay there. We visited Casa Nirvana with our two children (7 and 12) and were taken aback by the wonderful location. Set in a tiny village in the Tuscan hillside, it was peaceful and really made us feel we were experiencing the 'real Italy' with no tourists apart from ourselves. The local residents were very friendly and the caretaker had thoughtfully left delicious local tomatoes, peaches (the size of a fist!) cheese etc so we could make breakfast after our late arrival. Having a car was a must, and allowed us to explore the beautiful and historic town of Pontremoli, La Spezia with it's chic marina and the amazing coastline of the Cinque Terre. Lucca was also a lovely surprise and the place to go for stylish shops. 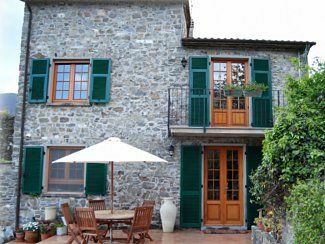 The house itself was very well equipped, very clean and beautifully decorated in Tuscan style. The children loved it and we discovered a fantastic outdoor Olympic pool complex 20 min away which was very well priced for whole day visits. We all really hope to visit again. From the first point of contact until our arrival, the owner could not of been more helpful. The view from the property is just breath taking and Casa Nirvana has been lovingly renovated the photographs on the owners page although accurate do not do it justice, you have to visit to appreciate its beauty. Everything you need for a self catering holiday has been thought of and the welcome pack was much appreciated. The property is very remote (but we knew this) we enjoyed visiting Lucca, Pisa, Florence, Cinque Terre and even Lake Garda. Thanks to Colette’s (housekeeper) suggestion we also visited Pontremoli (amazing cathedral) and Bagnone. We spent our last day chilling in the garden making the most of the sun and views!! The cats gave us a warm welcome on our return to the house each evening and we also enjoyed a lovely meal at the restaurant down the hill. I would not hesitate to recommend Casa Nirvana and hope to return one day soon. Casa Nirvana ligt prachtig in een rustig bergdorpje. Mooi uitzicht over de heuvels en Apenijnen. Huis is compleet en schoon met een lekker terras. Als je van een bad houdt is de badkamer prima, ben je een douche type dan is enige lenigheid geboden. Hoewel noordelijk gelegen ten opzichte van toeristische steden zijn Lucca, Pisa en Florence goed te doen. Aanrader als je van een ontspannen week houdt. The Gulf of La Spezia (Gulf of Poets) is 20 mins drive. From La Spezia port, regular boat services run to the bustling and cosmopolitan beach towns of the Gulf of Poets, aswell as the charming villages of the World Heritage Cinque Terre. By car the Cinque Terre is 1 hour's drive, or 15 mins on the train from Aulla. The fashionably chic, sandy and certified blue flag beaches of Massa, Carrara and Sarzana on the Versilia coast, are approximately 45 mins drive. Water sports are widely available. Airports: Pisa, Parma and Genoa are all 1 hour's drive away & bargain flights with Ryan Air, Jet2 or EasyJet can usually be found. Trains: The train station at Aulla is 20 minutes drive from the house. Trains run from here to Pisa, Florence, Milan, Lucca and throughout Italy. Car hire: The village has a regular, reliable bus service to Aulla, with several stops en route. Whilst car hire is not strictly essential it is recommended, in order to make the most of the sightseeing opportunities. The nearest village with a bar, restaurant and alimentari (grocers) selling fresh bread to order, is a 10-15 minute walk. It is a 10 min drive to the small town of Barbarasco with several bars & restaurants. The largest town in Lunigiana is Aulla - 20 mins drive away, with a range of shops, banks, market, sports complex, petrol station & medical facilities. The historic town of Pontremoli is 25 mins drive, La Spezia 20 mins, Old Sarzana 40 mins, Pisa and Lucca 1 hour and Florence 1½ hours. Lunigiana is a lush and fertile region in northern Tuscany. An area of outstanding natural beauty, where wildlife thrives and medieval hamlets are dotted all around. It lies between the coastal province of Liguria to the west and the Apennine mountains to the north-east. To the south-east, the region is dominated by the peaks of the Parco Alpi Apuane and beyond these lie the Renaissance Cities of Florence, Pisa and Lucca. It is a sunlit land, of chestnut covered hills dotted with ancient villages and terraced olive groves. Picturesque and not yet commercialised, here the pace of life is slow, the food and wine robust and the smiles as warm as the sunshine. Here the old-fashioned courtesies are observed and the stranger is made welcome. The coast of Lunigiana and nearby Liguria is stunningly beautiful. Characterised by charming villages and clean water, it includes the Italian Riviera, the Gulf of La Spezia (Gulf of Poets), the World Heritage site of The Cinque Terre and the certified blue flag beaches of Versilia, which are set against the magnificent backdrop of the marble mountains of Massa Carrara. Lunigiana has a particularly rich culture, with many beautiful churches, castles, towers and walled villages. Names of once-mighty families such as the Medici and Malaspina are commemorated by the fountains, piazzas and palaces they left behind. It is a veritable paradise for walkers, painters, photographers, and those who simply enjoy the pleasures of life; and is full of natural curiosities such as the caves near Equi Terme, site of the natural sulphur baths. Throughout the year there are numerous festivals, street markets and celebrations. Each February sees a spectacular Carnival in Viarreggio and in Pontremoli, the “Medievalis” festival takes over the town for 4 days every August, with medieval jousting on horseback, fire eating, and a host of other unmissable entertainments for all the family, aswell as delicious foods, mouthwatering wines and market stalls. Booking Notes: Please make initial contact via this website, by email or telephone, I will happily hold dates provisionally for 48 hours. A completed booking form and deposit of 25% secures a booking, and the remaining balance is due 60 days before the date of arrival. A £50 refundable security deposit is required for potential breakages, payable with the final balance. On receipt of full payment, directions and the Casa Nirvana information handbook will be sent by email, along with the wifi password and arrangements for keys. Online payment and booking is accepted via this website. Changeover Day: Changeover day is flexible. Arrival is usually anytime after 14:00 and even very late arrivals can be accommodated. Departure is anytime before 10:00 but we can often be flexible with these times, depending on other guests arrangements. Notes on prices: Prices include all utilities, linen, towels and cleaning aswell as a small welcome pack of grocery essentials to kick off your holiday in tuscan style! Shorter stays than 7 nights and discounts for longer term stays are both negotiable.